I'm a little late to the game here, I admit. 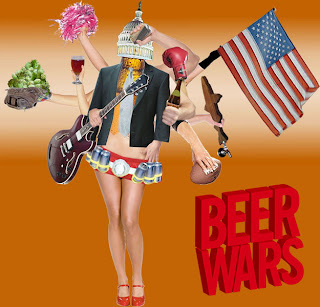 The documentary film, Beer Wars, appeared more than two years ago. I just watched it on Netflix last week. I can't say why it took so long. Sometimes these things happen. The point of the film is quite clear. Director Anat Baron, a former bigshot with Mike's Hard Lemonade, intends to reveal how the beer industry is structured to maintain the power of the large breweries, represented primarily by Anheuser-Busch and MillerCoors (Miller and Coors in 2009), to the detriment of small breweries. Shows how the large companies use political influence to keep the laws as they are, very much to the benefit of the major brands. Shows how the large companies have used advertising dollars (more than $800 million a year) to con consumers into thinking they are getting a well-made, tasty and refreshing product, despite the fact that macro-brews are made using inferior ingredients and automated processes. Image is everything. Why bring this up now, two years after the fact? I mean, craft beer is continuing to gain a foothold in the marketplace, despite the stacked deck. Why should we be concerned about the message of the film? Here's why. The continued growth of the craft industry means the big guys are increasingly trying to find ways to either squeeze or co-opt craft brands. Making distribution difficult is their first line of defense. They are also buying up small brands, closing down the breweries, firing employees and producing the beer at gigantic, automated factories. Another strategy is creating shill brands, like Green Valley Brewing of Fairfield, Calif., brewed at a huge Anheuser-Busch facility, but marketed as a small brand. I need to digress for a moment. There's been some argument on various blogs about the meaning of craft. My opinion is the term has little meaning today. To me, craft suggests small and perhaps handmade. But great beers are being produced by breweries that are not small. Deschutes and Widmer come to mind. There are many others. What these large craft brewers share is independence and an attention to quality ingredients and processes. Which brings me back to the call to action of Beer Wars? To me it's this: If we want to protect the integrity and longevity of true craft brands, we need to buy the products of typically small, always independent brewers whenever and wherever possible. That usually means buying locally-produced beer because most of these brands have regional distribution at best. Secondly, it means staying away from beer produced by the major brands, even if they are decent (Blue Moon, a Coors brand, comes to mind). Why? Because the big guys use those dollars to undermine the integrity of the true craft industry. End of story.